HijiNKS ENSUE At Toronto Fan Expo! Toronto Fan Expo is THIS WEEKEND August 23 – 26. 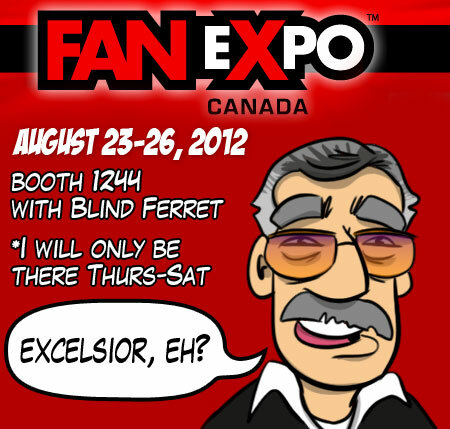 I will be at booth 1244 with the Blind Ferret crew Thursday through Saturday. I have to skip out on Sunday because my daughter starts school the next morning and I don’t want to be the dad that regrets his kid’s first day of kindergarten for the rest of his life because he was eating nachos and doing sketches for Canadian Narutos. Don’t get me wrong, sketches for Canadian Narutos IS EXACTLY living the dream. I just know that I will have another opportunity for that in the future, where as my kiddo will embark on her educational adventure just the one time and I’d kind of like to be there to see it. YOUR MISSION, CANADIAN FANCY BASTARDS: Come see me at the show! 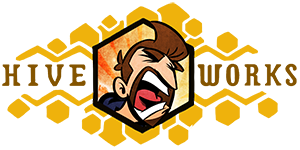 Say hi, talk about stuff, buy a thing or two. I’ll have books one and two, shirts, sketch cards, maybe some stickers, CERTAINLY a crap ton of prints (except for YOUR favorite one… I’m only bringing two of that one and they WILL sell out), and I’ll be debuting the new Fighting Time Lords and Grammar Dalek shirts. I’m going to level with you Toronto. I’ve been to you before. You were quite nice. You were kind to me, and your Karaoke/Korean BBQ were fantastic. That said, I didn’t have the best sales the last time I was in you. You know where I had the BEST sales I’ve ever had? Calgary. Yep. Calgary. Are you going to take that from Calgary? Did you hear what Calgary said about your mom as it gave me all of it’s weird, rainbow colored monies? Toronto, you DO NOT have to take that kind of abuse from Calgary. You march right down to the Metro Toronto Convention Centre and you show Calgary what kind of Fancy Bastards they got in TORONTO! [woohooos and cheers all around]. If you’re in the mood to bring me tribute in order to garner my favor, I’m trying to cut back on the sweets these days. I’m not saying NO SWEETS. Just not ALL OF THE sweets. I’m still entirely partial to Starbucks doubleshots in cans, Iced Soy Latte’s and tiny bottles of booze that can be pored into other drinks. You know how I role. Clandestinely drunk. Posted in Comic Blog and tagged appearances, conventions, fan expo canada, toronto. I think you've been doing fine Sir, keep up the good work. … but I was coming Sunday with all my life savings! Kidding! Have a great weekend man! I'll come by and give you a big Sandtrooper hug. You can always have more kids. I moved out here three weeks ago from the other side of the bloody country. After years of reading about all the cool conventions all you guys go to, I am finally a short, three-hour drive away from one you will ALL be at. TOTALLY doable– and I got stiffed on some money and can't afford to go. OH GODS I AM SO DEPRESSED. I did buy 3 shirts when you were in Calgary cause I rock.